Well, as you can see, today is not Friday. I spent all day Friday driving and Saturday spent with my DD who’s off at college. I have a little time this morning before meeting with DD1 so I’m just getting around to writing about what I’ve worked on this week. I did a little on my socks though not as much as I had planned. I started my first Geek-Along square and finished it. I opted to start with the Superman square and though my colors on hand seemed darker I really like the way it turned out. So what’s the plan for the needles this week? I WILL finish the first Maeva sock. I have cast on my second GAL square and am working on a test knit cowl for a designer friend. Until next time, I’ll be having fun with my girls at the beach and knitting. 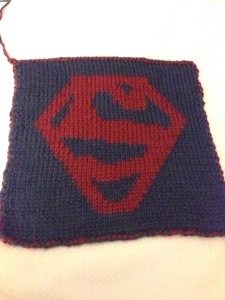 This entry was posted in Finish-line Friday, KAL and tagged #TheBarbedDragon, GAL, Geek-Along, knitting. Bookmark the permalink. Thanks! It turned out great.